LLoree Dickens is the owner, artist, and creative director of LL Designs, which is an online store that sells awesome adult moccasins and adorable baby moccs. She is Arikara and White Earth Chippewa from the Three Affiliated Tribes (Mandan, Hidatsa, Arikara Nations). 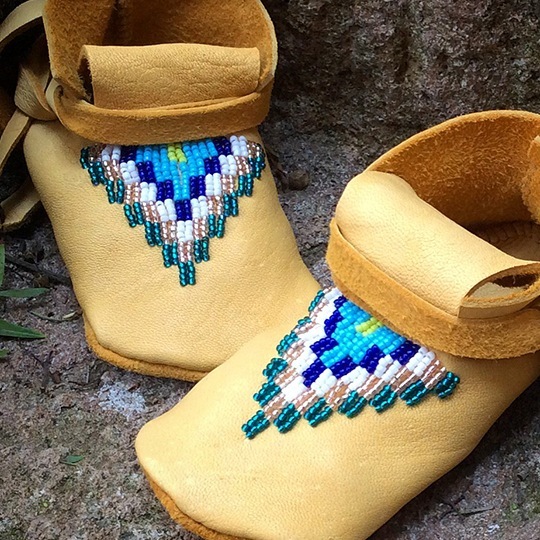 Dickens is also the newest artist to join the Beyond Buckskin Boutique roster with her beautiful beaded footwear. We love what she does, and we wanted to share some behind-the-scenes info with you through an interview. Scroll down to learn more about this rockstar artist who is keeping traditions alive and contemporary. BB: Thank you Lloree for taking the time to tell us more about your work and your brand. 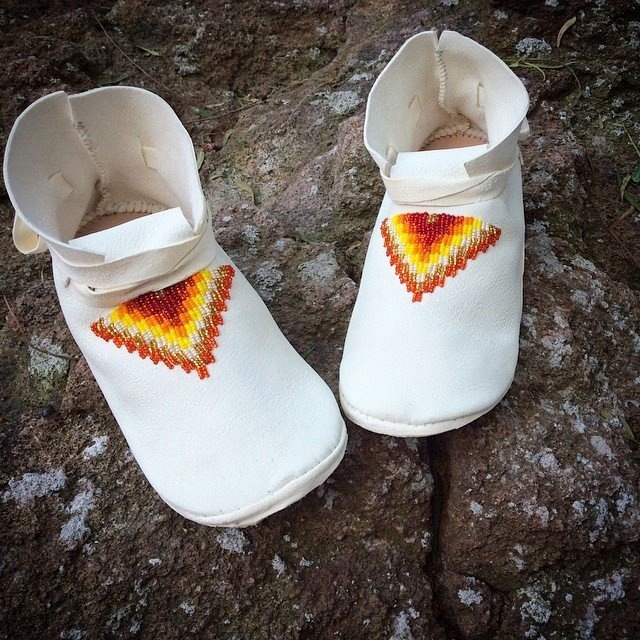 Can you tell us when you started creating moccasins? LD: I’ve been creating since childhood, but I’ve been making moccasins for 12 years now. I started creating moccasins from the desire of creating my own pair and I have always been fascinated and in love with the outcome of time, patience, and beauty that stems from beadwork. Beadwork is my meditation. It creates a whole world of visions, ideas, dreams, thoughts and prayers. BB: I also find the beadwork process to be a form of meditation! It's so inspiring, and requires great focus! Can you describe the general process you go through to create your work? LD: I love vibrance and colorful designs. I’m always in search of color combinations, themes, a feeling or a certain “look”. Nature and food is a huge inspiration…there is so much color in the natural world that we don’t notice on a daily basis. 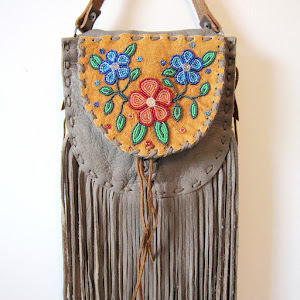 I use a variety of colors when choosing my deerskin leather and choose the best and most vibrant beadwork combinations. 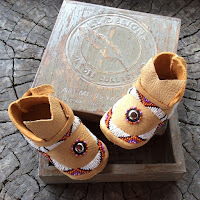 Whether my moccs are for a newborn to adult, my beadwork and construction process varies from whipstitch to individual bead stitch and lazy stitch. The technique all depends on the detailed intricacy of my designs. My moccs are available in soft sole and hard sole. Every step of the construction process is 100% handmade. Attaching the soles are made with a strong durable synthetic sinew. Ideally, I always want my moccs to appear neat, as if they were constructed by machine. 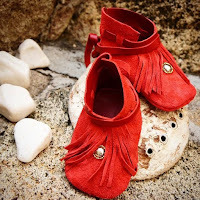 This is the quality of our moccs, and I stand by my company's statement that they are 100% handmade and authentic. Each moccasin can take anywhere from a day to a week to construct depending on the amount of beadwork. 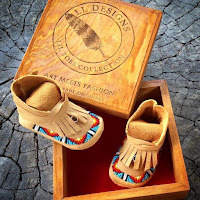 Our handcrafted wooden heirloom boxes are also a great addition to our moccasins. 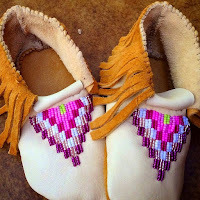 Each box is hand-painted, lined and the feather is painted specifically to match the color of beadwork on our moccasins. BB: That is so amazing! I love the level of customization that goes into your work. What or who is your inspiration? LD: My passion for art and appreciation is what inspires me. Creating a product that has meaning and can be cherished for generations. I love the works of so many Native American artists and love Native fashion. I love using traditional colors but I also love creating with vibrant contemporary colors that stand out and pop! I’m inspired by both traditional and contemporary ideas. LD: My most challenging project to date has been starting my company. I am very well educated and this has been an avenue that I’ve thought about but never pursued. I’m not sure if you would consider this a project, but it feels like a huge project to me and I’ve taken the leap! I’m also working on creating a new line of women’s wedge heels that combines softness and boldness. A design that is so soft to the touch but colorful and bold in color. I’m hoping to have this launched early 2016. BB: That would be great! What other goals do you have as an artist? LD: My goals as an artist is to share part of who I am and the authenticity of my work with the world. I hope to educate what authenticity is, be a positive role model to others throughout Indian country. 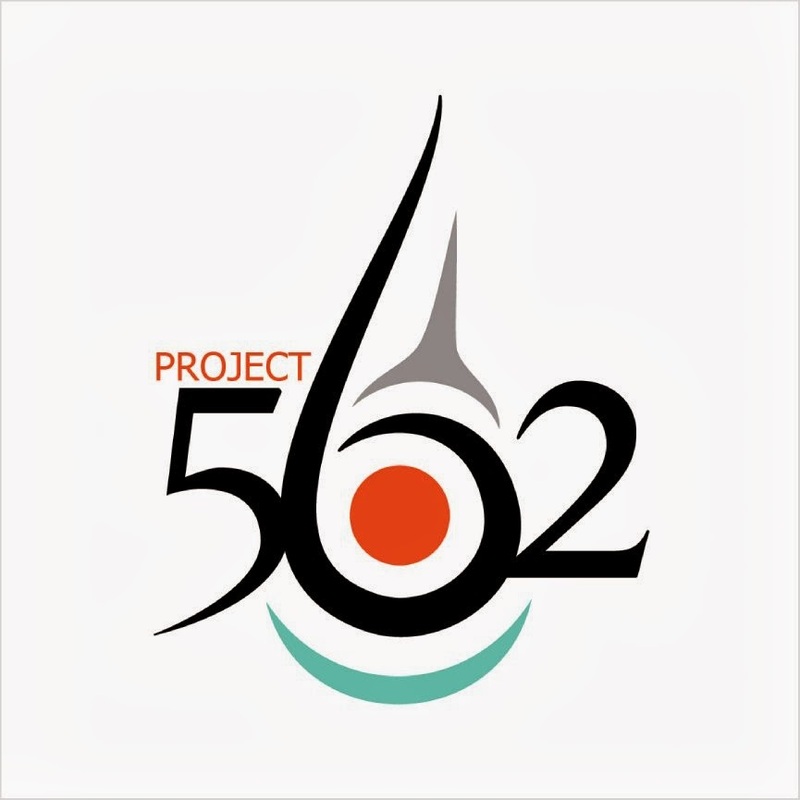 I hope to contribute and be a part of the talented Native artists and entrepreneurs throughout the world. BB: And there are some talented ones out there! No doubt, you fit right in! Who are your favorite Native designers? LD: I may sound a bit biased, but of course - Kathy Whitman’s work is amongst my favorite artists/designers. Also I’m in love with Caroline Blechert’s jewelry and Chenoa Williams stunning cuffs. 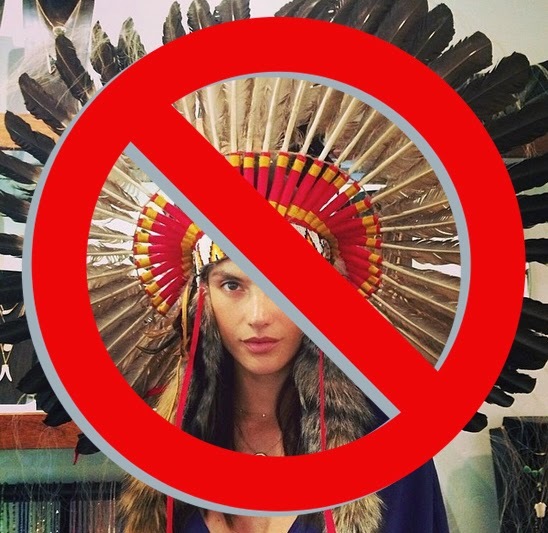 LD: The leading “Native fashion” products in the world are not actually Native-made, therefore, Native fashion means Native Authenticity. There are so many companies that have changed the moccasin design to a standard generic moccasin look that is not authentic. Although those moccasins are very cute, there is no story, or culture behind them. Just the term moccasin holds its own historical definition. Head over to the Beyond Buckskin Boutique and shop Lloree Dickens' amazing moccasins now!